Coming off a Gold win at the 15U Challenge Cup, the girls of INVASION were revved up for solid day of play at the 14U Challenge Cup. Starting out in our pool against Wildcat 13U Jaguars, Invasion dominated serving up two pizzas in the sets winning 25-9, then again 25-9. Onto the 14U Wildcat Tigers, where INVASION really started to gel with some good blocks and a couple stellar digs – watching for tips was a key to winning this game. INVASION serving was also on fire during the two sets we played with the Tigers – the girls stayed strong with another decisive win in the first set 25-7 and defended out a win in the second set, 25-20, after the Tigers started to fight back. With INVASION first in their pool, the girls were looking forward to what the afternoon would bring. Spirits were high, but there was still much to do and some great teams to play. In the cross over we met up with 14U Unity and handily beat them in two sets 25-17, and 25-12. This win positioned INVASION to play for the first time their Durham Attack sister team, 14U Red Her-I-CANes. What an exciting show of skill and talent from the Durham Attack Club. Both teams worked hard and energy was explosive! INVASION came from behind in the first set, pushing hard to rack up 4 points in the last rally, but lost the set 20-25. INVASION took the second set 25-17 after fighting hard right out of the gate and defending well. The game went to the third set and after very close game with points going back and forth, Her-I-CANes took the game by the requisite two points, 15-13. What a match! Both teams showcased their skills and determination. Well done to all the ladies of DA 14U Red. 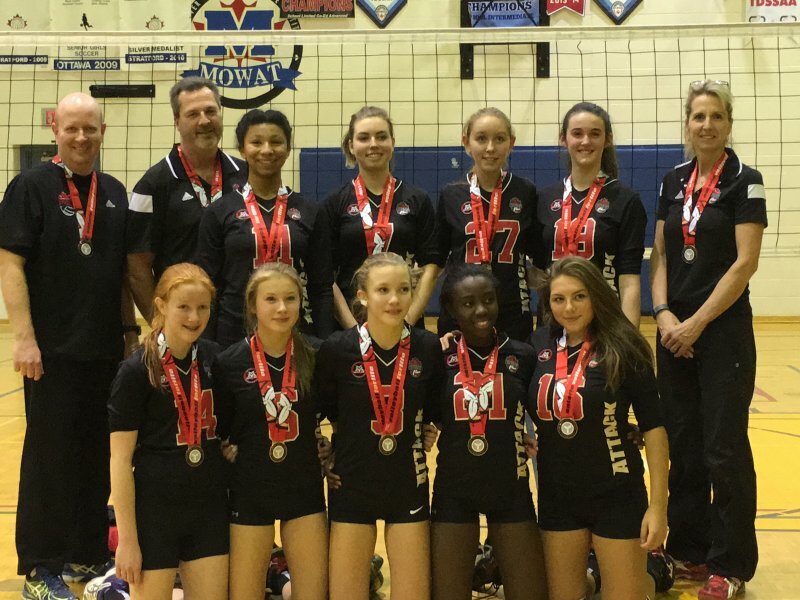 INVASION moved to the bronze medal match, where they fought tough against the 14U Scarborough Titans. Pushing both sets hard to accomplish a medal win, INVASION again shone with strong serving and great teamwork! 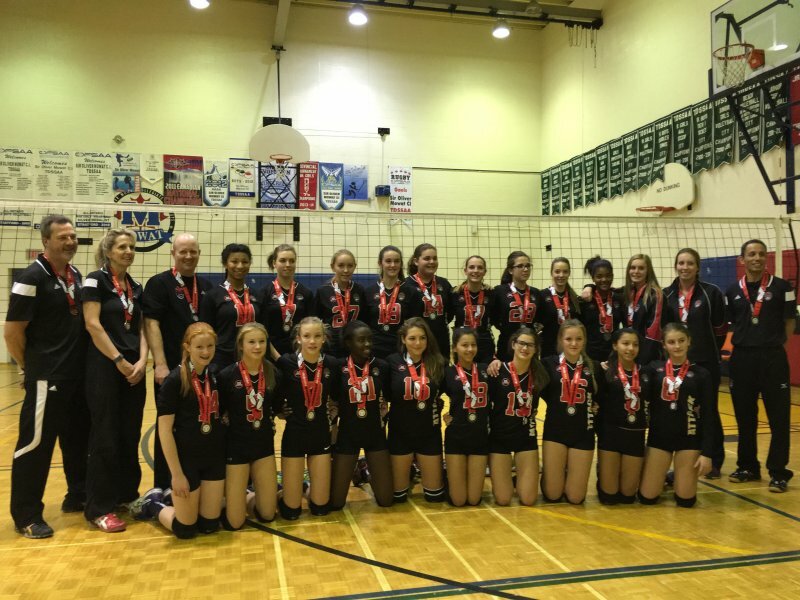 Relying and trusting each other on the court, the athletes pulled together and secured the bronze win in two sets with the second set final of 25-21. Congrats to our DA 14U Red sisters on their silver medal showing. It is great to have the two DA teams side by side in the medals. Special thanks to our great coaches Carol, Don and Gord for all the work and dedication they have shown our girls of INVASION so far this season. The girls are becoming not only a better team and better players, but also better people as they are coached during these experiences and developments. Congrats INVASION on the Bronze!